We recently flew to Italy to test the redesigned 2019 Ducati Scrambler Icon. 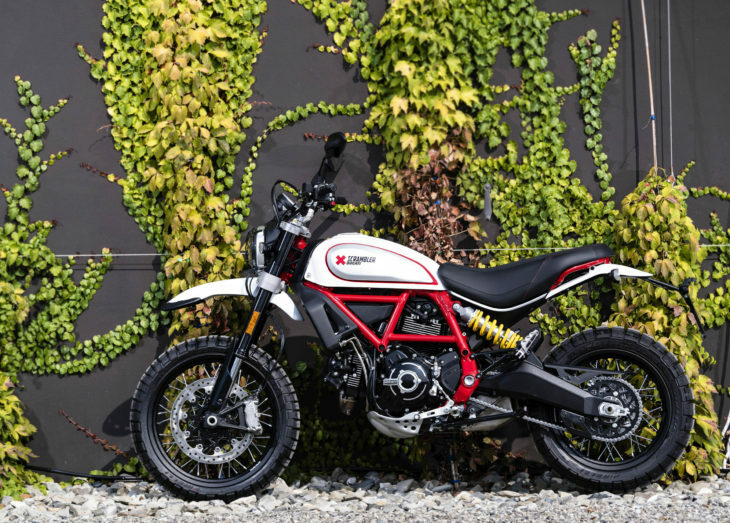 The changes to that model for 2019, including Bosch cornering ABS, fuel gauge, blacked-out engine, LED running lights and turn indicators, adjustable brake lever and new hydraulic clutch (not to mention the Multimedia System that allows integration with your cell phone) have now been announced as features of the redesigned 2019 Scrambler Full Throttle, Café Racer and Desert Sled, as detailed in the following press release. Three all-new additions to the Scrambler range – Full Throttle, Café Racer and Desert Sled – presented at INTERMOT in Cologne. Cologne, Germany, 2 October 2018 – The Ducati Scrambler Joyvolution continues and the Land of Joy fun settings have been ramped up with the arrival of three fresh versions. Right now, the new Full Throttle, Café Racer and Desert Sled are gearing up to take center-stage at INTERMOT 2018 (International Motorcycle, Scooter and E-Bike Fair), to be held in Cologne from 3 to 7 October. The new Full Throttle takes its cue from the flat track Scrambler ridden by Californian racer Frankie Garcia in the 2018 American Super Hooligan Championship. With its two-tone black-yellow white-striped tank, all-new rear end with dedicated seat and white-rimmed yellow number holders, this bike has a real dirt track competition feel. A low-slung tapered handlebar – light and ergonomic – stubby front mudguard and dual-silencer exhaust add to the distinctiveness of the Scrambler Full Throttle. With its renewed livery, the Café Racer draws its inspiration – and Silver Ice Matte graphics with blue frame – from the legendary Ducati 125GP Desmo. The new 17″ spoked wheels and aluminium bar-end mirrors give the bike a cool ’60s race look, while a modern radial front brake pump provides braking performance on a par with that of a sport bike. And there’s more: the exhaust with dual tailpipe, nose fairing, lateral number holders (with the number 54 in honor of Bruno Spiaggiari) and stubby mudguard are all clear references to the bikes that roared down British streets in the ’60s. 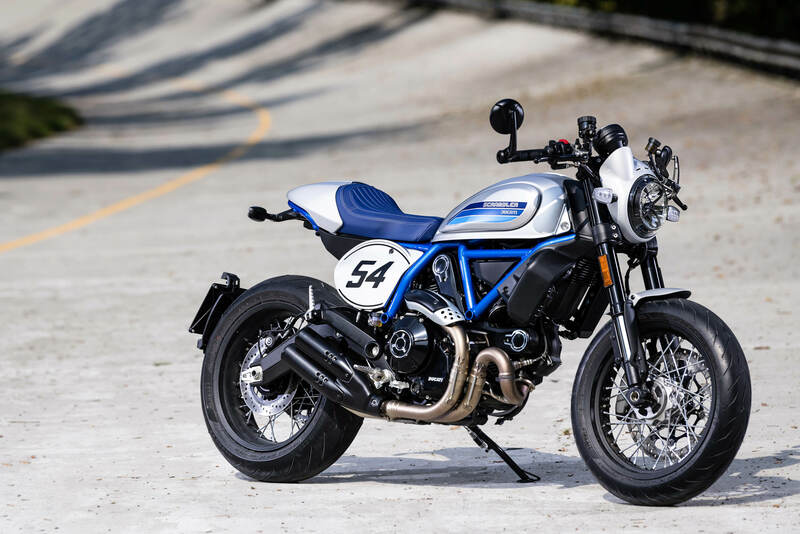 The Ducati Scrambler Desert Sled rekindles the spirit of classic American off-road bikes without compromising on Ducati Scrambler lifestyle values. With its red frame, new seat with color-coordinated stitching and spoked wheels with black rims, this bike is more up-to-the-minute than ever. The new Desert Sled also features an Off Road Riding Mode that allows ABS disengagement for down-in-the-dirt fun. A dedicated riding position and adjustable Kayaba suspension also ramp up the fun factor. Rugged off-road character also oozes from the type-approved headlight mesh guard, high mudguards (specially designed for this version) and engine skid pan. These latest versions take self-expression to the max. And they stand alongside the new Scrambler Icon from which they inherit new aesthetics and technical features: presented to the press in mid-September, the latter will get its world-first public preview at INTERMOT 2018. The aluminium of the new, beefier side panels matches the steel of the teardrop tank and the glass of the headlight flawlessly. A black-painted engine and brushed cylinder head fins add even more eye-catching panache to these new versions. The all-new headlight with LED DRL (Daytime Running Light) boosts bike visibility in traffic, even in daylight, as do the new auto-off LED indicators. More ergonomic switchgears simplify scrolling of the LCD menu, which now shows selected gear and fuel level info. They also allow smooth operation of the Ducati Multimedia System, which lets riders listen to playlists, answer incoming calls or chat with the passenger on the intercom. Moreover, thanks to the safety provided by Bosch Cornering ABS – all-new and exclusive for this category of vehicle – riding is now more carefree than ever. Riders will also appreciate the new softer-feel hydraulic clutch control, while the adjustable lever – like the one on the front brake – ensures the lever-handlebar gap can be adapted to individual needs. Just four years after the Scrambler Ducati brand official launch – in Cologne itself back in 2014 – over 55,000 bikes have been sold worldwide. 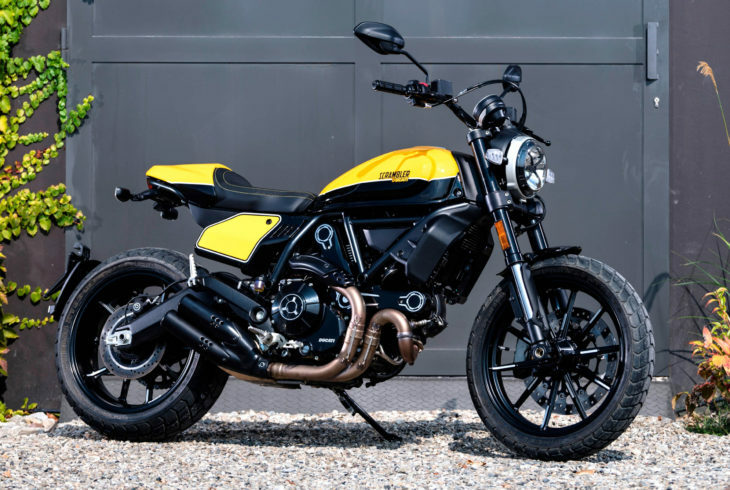 The breadth of the brand is also evident in the four Ducati Scrambler Camp stores in Borgo Panigale, Padua, Barcelona and New York, plus the two Scrambler Food Factory restaurants opened in Bologna. To see the official launch video for these versions check out the Ducati Scrambler social networks or go to the official website and share the content through #joyvolution and #scramblerducati. All Model Year 2019 Scramblers will be available in North America in Q1 2019. I rode a full throttle and it was a fun bike. Exhaust was too close to my right ear though. Better make sure those earplugs are in tight. It’s nice and loud when you get on it. The Cafe Racer and Desert Sled are both really attractive bikes. Are those tires tubeless? Seems like someone has a dream job! One more reason to cry at night, I reckon! I like them all, Ducati has done a great job on these.. Does anyone know what the valve adjustment intervals are? I thought I heard when they first came out that it was something like every 7500 miles. Either way the valves should be fairly easy to do yourself I would think. Desmos are a grease monkey’s nightmare. Ducati’s newer water-cooled engines have valve intervals comparable to a Japanese bike, though. But Scramblers have old re-tuned Monster 796 and 1100 motors which are quite similar to the engine seen on 1970s Ducati SS. If you want reliability; then you may want to consider the water-cooled Monster 821. Very reliable, dependable motorcycle; or so I’ve heard. Unless they’ve updated the schedule for 2019, it is still 7500. And yes, they are pretty easy to adjust as far as desmos go. Adding some aftermarket retainers on your first adjustment will go a long way towards keeping the valves in spec going forward. They aren’t super difficult, but Desmo valves are more difficult than your typical bike’s valve adjustment. I’d like to know the interval too. Beautiful bikes….way to go Ducati! And (some) people here get all indignant when Harley does the exact thing with “new” models via the exact same method of altering the paint, wheels and junque they put on their bikes. It’s not a bad thing, really. Unless Harley does it. Ducati does it and suddenly its a “joyvolution in the land of joy”. This weirdass ad copy begs the question, “When’s the “HR Pufnstuff Scrambler” due out of the closet? Nice! the Cafe Racer is the most interesting. For me, the Indian FTR1200 is the best looking, most interesting bike out there. But Ducati’s Monster and Scrambler line are my next favorites. The Ducati prices are very enticing. Going with the majority-cast wheels and a rear fender on the same bike would be my preference. I was riding in the ’60s and can’t quite grasp a “cafe scrambler”. The two styles didn’t have a lot in common. If the Cafe had cast wheel, I’d like it that much better. Spoked wheels that are not tubeless are too much of a PITA since I do my own tires. I think I could forgive that Cafe racer just about anything. oh yeah, i prefer mag wheels, too. The Café Racer and Full Throttle are superb designs. Ducati out flat-tracked the Indian with he Full Throttle. It may not be as powerful, but it captures the look perfectly. I’d ride either one of these two Ducatis. The Desert Sled look cool too. That Scrambler Café Racer is one of the prettiest bikes I’ve ever seen. Full stop. That blue trellis frame and pleated seat with the blue and silver tank is just gorgeous. +1 on the Cafe, I hope for an 1100 version. I agree. The Cafe is magnificent. That livery plus the more agressive poise provided by the 17″ wheels come together to cut a seriously stunning image. I was just looking at that. The front tire looks like a pretty unusual size, very high volume/profile and I agree, it looks great with the whole package. Even Suzuki are getting on the bandwagon with the SV650 update. I’d say that front tire is a pretty standard 120/70. 180/55 on the back. I believe the black rim contrasted by the silver spokes contributes to the illusion that the tires look a little more balloonish than they actually are. That Café Racer looks really good. The only thing which gets me is that minimalist front fender. It tells me this is sunny weather only bike. So, watch weather forecast before your ride! thing is, i will not likely ride an mc again, due to health constraints. I am sorry for you. I am also pushing it a bit (due to age) but in less favorable climate – Ontario, Canada. Yes, I have to take occasional rain into count. Ducati could save a lot of money if they didn’t make the front brake lines about a foot longer than needed. And can anyone tell of an advantage to remote brake/clutch reservoirs over integral? Each is used, depending on model. Other than that, nice machines. They’re saving money by cutting the front fender in half. They only use the remote reservoir on models with the radial master cylinder ( I.E. Cafe Racer). When it comes time to rebuild them/replace seals it is alot easier. Also you can get more braking force with that design because you dont have to worry about the extra bulk, complication and casting required to integrate it.